You might think the dust is finally settling on campus after Commencement and Reunion, but this year we’re stirring up more dust before summer starts in earnest. 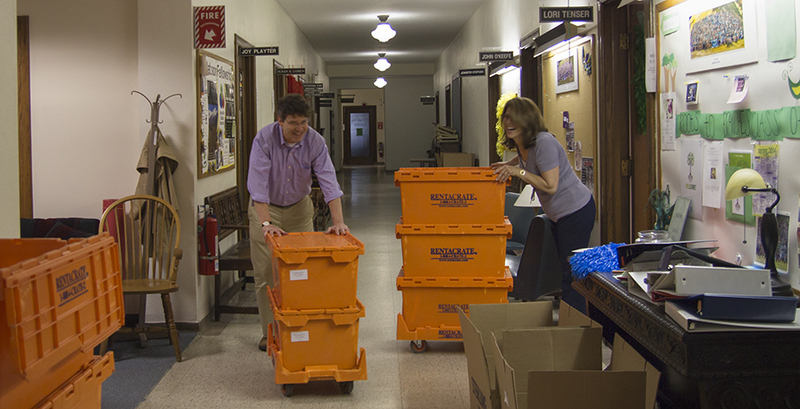 The corridors of Green Hall are bustling with movers, dollies, orange rent-a-crates, and people packing years of their profession into boxes for a move. Moving is, as Director of Advising and Academic Support Services John O’Keefe puts it, “surely no one’s idea of a good time.” He has packed six boxes and filled six more with recycling. But packing carries some excitement with it this time around, as the move—just across Tupelo Lane and beyond the Chapel Lawn—signifies the completion of the first major project in Wellesley’s campus renewal plan: Schneider Center. This week, according to Paul McAndrew, project manager for the Schneider renovation, Student Financial Services' furniture moved on Monday, and Tuesday was SFS staff members' first day in the building. Furniture for Students' Aid Society, International Studies, and Faculty Housing and Transportation is moving on Wednesday, with those offices' first day in the building on Thursday. The Registrar and Class Deans' furniture will move on Friday, June 13, and staff members' first day in the building will be the following Monday. McAndrew explains that over the next few weeks the contractor will be completing the “punch list”—miscellaneous tasks of patching and painting, final cleaning, etc.—as well as paving exterior walkways and landscaping. A celebratory event marking Schneider’s completion and new role on campus will be held in the fall.